Departmental webmasters can use the administrative tool to easily add their websites to the index, check search statistics and keyword relevance, and view reports on their website’s compliance with university web standards. In addition, they can easily update site information such as keywords to make them easier to find. The system tracks visits and search queries to give a better idea of the most important topics at the university in any given period of time. I designed and built the A-Z system to solve a number of different related problems, for admins in Web Services, for university web developers, and for the overall university population. 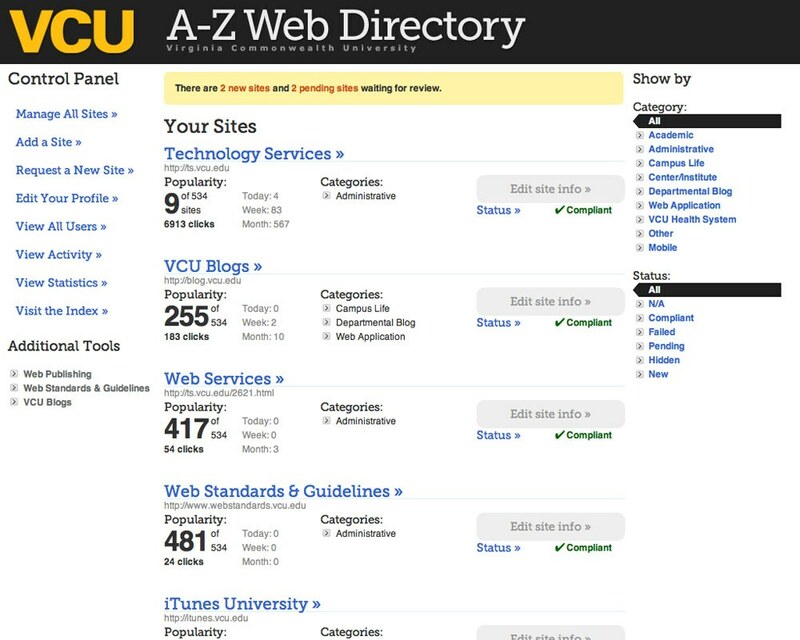 Web Services needed an easy way to track every website at VCU, who “owned” it, where it was hosted, and whether it complied with VCU web standards. Web Services wanted to have concrete search keyword and visit analytics to help inform discussions on which sites (and thus information) were most important to visitors at any given time of year. Web developers wanted have more ownership over their sites’ search data and findability. Web developers wanted to know whether their sites complied with VCU web standards, and what they needed to do if they didn't. Everyone in and out of the university wanted to be able to find departmental and organizational websites easily, whether through searching or browsing.